I want to decrease size of the .pdf filled with images. In Preview in can be dome through Export and set Quartz Filter-> Reduce File Size before saving. The file indeed decreased from ~30MB to 0.37MB. But the result has such poor quality that images are barely readable. I saw an examples of using Image Magic to achieve that - but can it be done by Preview without any external software? The problem is - the default filter used during conversion has very low conversion settings. Thankfully, a custom filter can be added. The file should contain XML with new filter - you can base on the /System/Library/Filters/Reduce File Size.qfilter file or use my below example. Change compression setting, image size and add unique display name for your filter. I marked key settings by comments. 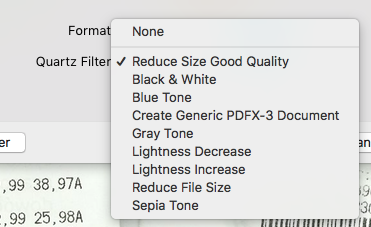 Select your new filter when exporting file. You can use this website: https://smallpdf.com/compress-pdf to shrink PDFs to a really small size. The PDF quality is still really good even after the compression. As per michalczukm answer, a quartz filter can solve this. I had created my own and shared it on Github. You can install it easily with a single command line. It doesn't install any software, just the quartz filter only. You can create your own Filter to reduce the image data size in the PDF, using Apple's built-in ColorSync Utility. Then select the Filter in Preview's Export. If you have a pdf which is version 1.6 or 1.7, you can use the duplicate setting in Preview. Preview will save the file as a 1.4 pdf and save about 50% in file size. As far as I can tell there is no loss of quality. No need to use the export - reduced file size unless you want further savings.